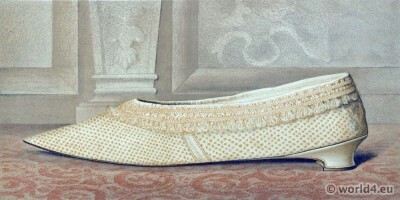 A SHOE OF THE REIGN OF GEORGE II. 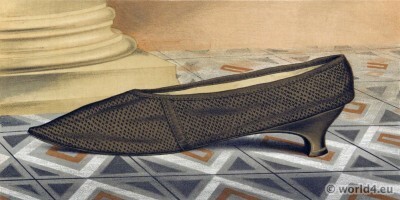 A LADY’S SHOE. COMBINED SHOE AND CLOG. This entry was posted in 1720, 18th Century, Baroque, England, Shoes and tagged Baroque fashion, Ladies' old-fashioned shoes on 6/9/18 by world4. This entry was posted in 1580, 16th Century, England, Shoes, Tudor and tagged Ladies' old-fashioned shoes on 5/15/18 by world4. 14th century medieval pointed toe shoe style. 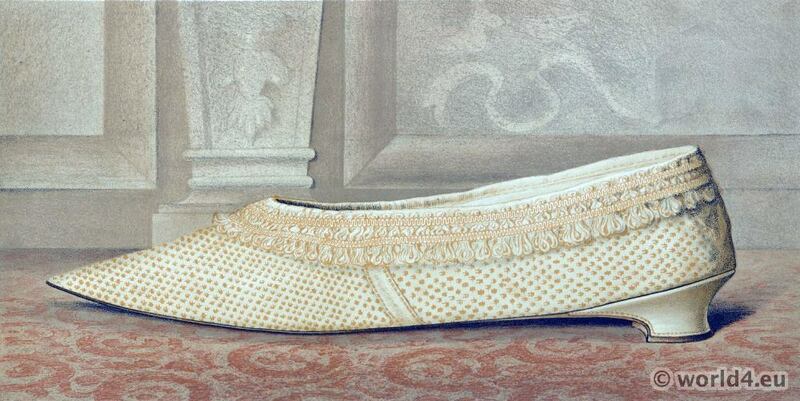 Shoe of German Emperor Frederick III. 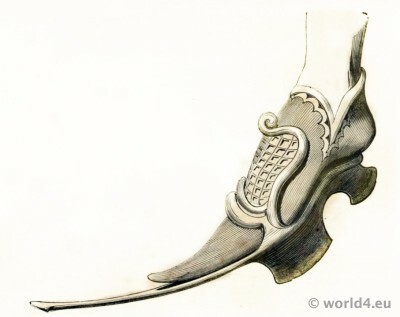 14th century medieval pointed toe shoe style (Crackowes). Chaussure avec patin de Frédéric III, Empereur d’Italie ou d’Allemagne (1400). D’après un tableau du temps, conserve à Sienne. Histoire des cordonniers : précédée de l’histoire de la chaussure depuis les temps les plus recules jusq’a nos jours. Paris : Sere, 1852. Author: P. L. Jacob, (1806-1884). 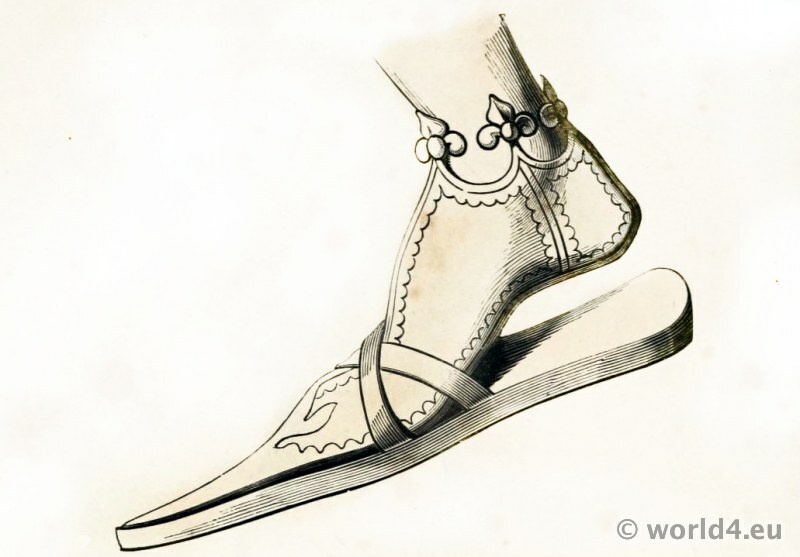 This entry was posted in 14th Century, Germany, Middle Ages, Shoes and tagged Medieval costume on 9/7/14 by world4. Shoe of King John II. of France. 14th century. Medieval shoe of King John II. of France (Jean le Bon). 14th century. Chaussure avec patin du Roi Jean (1440). From Histoire des cordonniers : précédée de l’histoire de la chaussure depuis les temps les plus recules jusq’a nos jours. Paris : Sere, 1852. Author: P. L. Jacob, (1806-1884). This entry was posted in 1350, 14th Century, France, Middle Ages, Nobility, Shoes and tagged Gothic costumes, Medieval costume on 9/6/14 by world4. 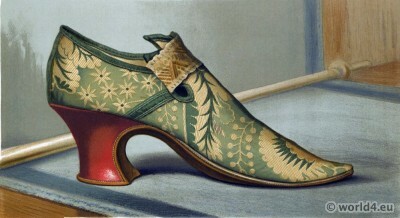 18th century regency shoe fastened by a ribbon tie. 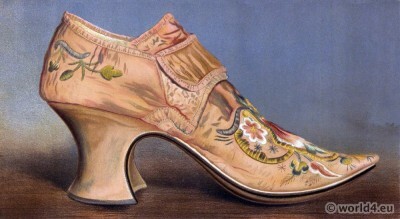 18th century regency shoe from the Georgian Era. THIS shoe is fastened by a ribbon tie, instead of the overlapping straps with ornamental buckle. It is made of plain black satin, with the silk binding that is usual at the present day. The heel is neatly shaped, and not of such extravagant height as that of other shoes of a corresponding date, probably about the middle or end of the last century ; toe pointed. 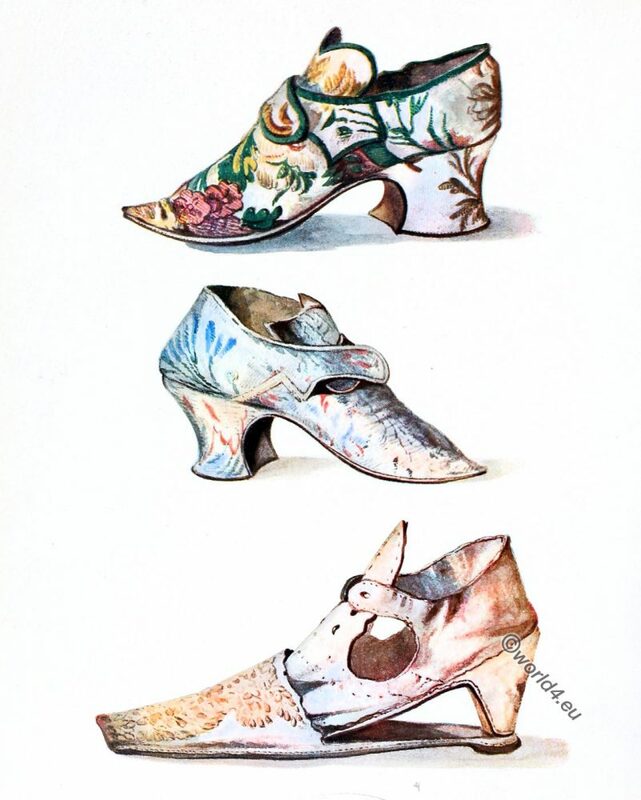 This entry was posted in 18th Century, 19th Century, England, Georgian period, Regency period, Shoes and tagged First Empire Style, Ladies' old-fashioned shoes, Regency period on 8/24/14 by world4. 16th century tudor shoe. Renaissance fashion period. FROM its appearance this shoe must be a very old one, but the date and name of its wearer cannot be discovered. It differs from many of the preceding ones by the fact that the heel, instead of being covered with the same material as the shoe, is formed of dark red leather. The old brocade is very rich in texture, and harmonious in colouring; and the flap above the instep is kept in place by a ribbon strap of a corresponding hue. This entry was posted in 16th Century, England, Renaissance, Shoes, Tudor and tagged Ladies' old-fashioned shoes, Renaissance fashion era, Tudor period on 8/24/14 by world4. 16th century tudor shoe style. Renaissance fashion period. NOTHING can be ascertained about Mrs Brown, the owner of this magnificent shoe, except her name. It is made of cloth of gold; of which, although for the most part the threads of the brocade are now tarnished and blackened with age, there still remain a few inches which have withstood the ravages of time, and which serve to indicate with what brilliancy and effect the chaussure must have gleamed and sparkled when fresh from the hands of the maker. 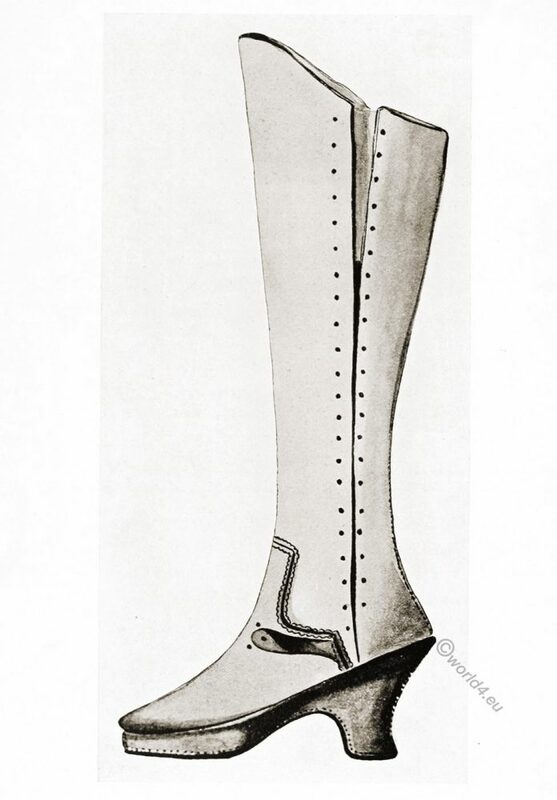 This shoe was worn with a large buckle, has an immense heel and pointed toe. It dates about the time of Queen Elizabeth (Elizabeth Tudor 1533-1603), and as it was procured in the vicinity of Kenilworth (namely at Leamington) may have figured at the revels and festivities there in its grand days. This entry was posted in 16th Century, England, Shoes, Tudor and tagged Ladies' old-fashioned shoes, Renaissance fashion era, Tudor period on 8/24/14 by world4. 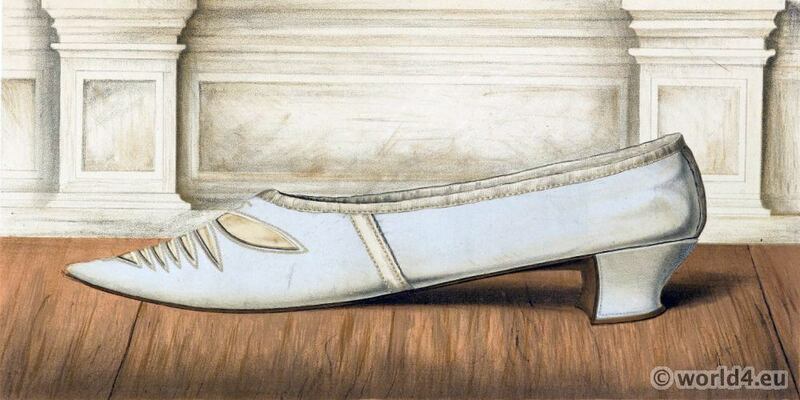 17th century shoe of the Duchess of Norfolk. Baroque period. 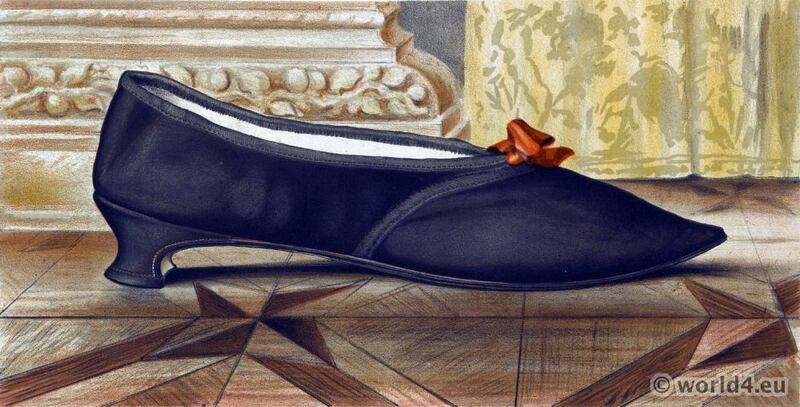 LADY MARY MORDAUNT (Mary Howard, Duchess of Norfolk and 7th Baroness Mordaunt, British peeress c.1659–17 November 1705) was the owner of this shoe, the material of which is closely spotted black silk. The shoe is without bow, tie, or straps, and has a plain and insignificant appearance ; and its low heel makes it partake rather too much of the nature of a slipper. 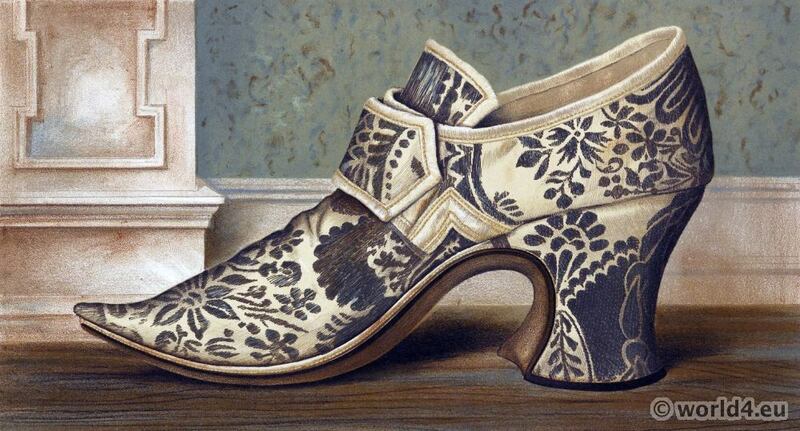 18th century rococo style shoe of Lilias. This entry was posted in 18th Century, England, Nobility, Rococo, Shoes and tagged Ladies' old-fashioned shoes, Rococo fashion on 8/24/14 by world4.